Allison Colosimo began her voice studies at the age of 13 with teacher Mary McGhee in her hometown of Thunder Bay, Ontario. As her talent developed, it was obvious that she would pursue a vocal career, so she enroled in the Honours Bachelor of Music program at Lakehead University, graduating in 1998. In the fall of 1997, Allison made her debut with the Thunder Bay Symphony Orchestra, performing educational concerts for elementary students. In February 1998 she headlined a Candlelight Series Concert with tenor Jason Hales performing Mozart Love Arias. Also in March of 1998 Ms Colosimo performed Vivaldi’s Gloria and performed the role of ‘Valencienne’ in Franz Lehar’s The Merry Widow, which was very well received by critics and the audience. During the spring and summer following her graduation from Lakehead University, Allison toured the United States and Europe with the world-renowned music ministry organization Celebrant Singers. Allison now resides in Mississauga and for the past seven years has been continuing her musical studies with teacher Madame Ginette Duplessis at the Royal Conservatory of Music. Since moving to the Toronto area, Allison has performed with the Mississauga Opera Company, the Thunder Bay Symphony Orchestra, and toured Southern Ontario with the four-person variety singing group Rhapsody Junction. In March of 2003, Allison was invited to perform a selection of songs by Canadian composer John Weinzweig at his 90th birthday party, and was one of her career highlights. Allison is currently a member of the Masterworks of Oakville Chorus in Oakville Ontario. She sings professionally as a soloist, though her range also includes other styles such as jazz, classical, and musical theatre. Allison is available for recordings and voiceovers, theatrical productions, weddings (ceremony and receptions), and other occasions. 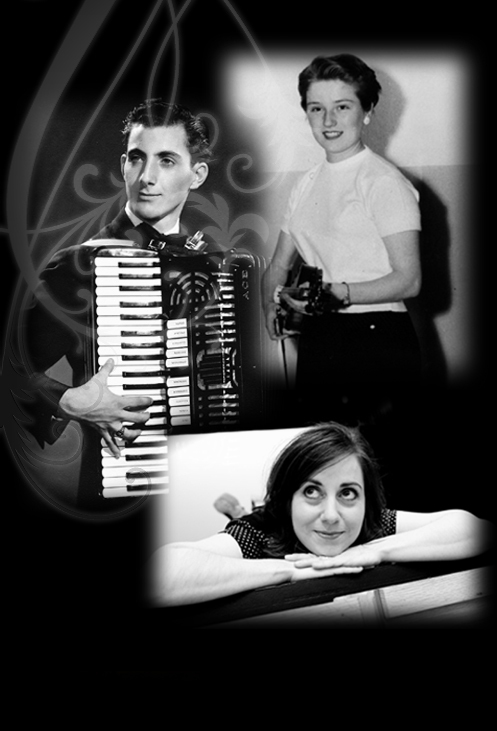 My parents were both musicians, my mother a violinist and my father an accordion player (there has to be a joke in there somewhere!). Music surrounded our family all the time: at church, at family gatherings and spinning from our turntable or eight-track player in the living room. All of us kids took music lessons – cello, trumpet, piano, violin – but nobody had any idea that I, the baby of the family, would decide to make music my life. When I was thirteen years old, my music teacher, Ms. Elizabeth Ganiatsos, was frantically trying to prepare us for our annual junior orchestra Christmas concert. I came skipping into the music room just in time for practice, and I sang as I skipped, doing both effortlessly. I was probably singing a Christmas Carol or some other tune I’d just heard on the radio. Ms. Ganiatsos heard me above all the usual clatter and instantly invited me to sing two Christmas songs at the concert. I, of course, happily agreed, with no hesitation or fear. To this day, I wonder what gave me the courage to sing in front of my many teachers and peers, and my shocked and bewildered parents. They had never heard me sing like that before! That was the moment when it all began – my singing career, that is. My mother would tell you it began when I was a child singing into the handle of my skipping rope in the back yard, but that I don’t remember. At the end of the school year, I sang at my grade eight graduation ceremony. I was well received, and I believe that was the first time I experienced the euphoria of the moment and the gift of applause. Nothing in the world can take me higher then being onstage, singing, belting it out, being on my game, nailing it! What an amazing gift it was to experience this so early in life.